The Aup du Seuil (spelt Aulp du Seuil on the map) is a synclinal basin upland area which runs down from the col de Bellefont (1900 m - also known as col de Bellefond) in the south, to the Cirque de St. Même (1300 m) in the north, and is separated from l'Alpe by the vallon de Pratcel (map). The lower northern end is forest-covered lapiaz, and the southern end is pasture, and it is all a highly protected nature reserve. It is spectacularly beautiful, but the real jewel in the crown is the Cirque de St. Même. This is where the truncated synclinal basin plunges 600 metres into an idyllic amphitheatre of streams and flat meadows, The water from the largest resurgence in Chartreuse emerges from a spring in the middle of the cliff face, and immediately plunges over the first of four waterfalls on its way down to the meadows 300 metres below. Above the resurgence is the largest and most impressive cave entrance in the area - the Grotte du Guiers Vif. This is the bottom entrance to the 16 km-long, 414 m-deep Réseau de Malissard cave system, which has two entrances on the plateau above. The Cirque de St. Même is, understandably, a veritable honey pot, and the PNRC have taken steps to control access into the area. Traffic is now prevented from entering the meadows of the Cirque, and a large car park has been built at the end of the access road. A charge of €3.50 (2017) is imposed at peak times. All these are very positive steps, but it is recommended that you avoid the area at weekends and bank holidays. The first four walks described below enter the basin from the west. 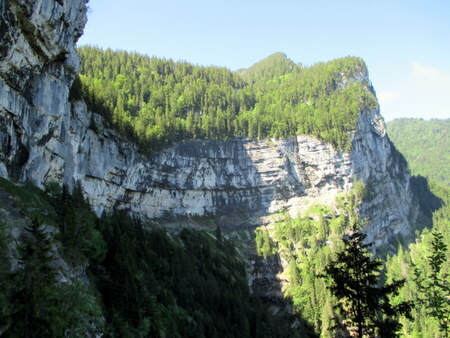 The fifth ascends the third highest top in Chartreuse on the western ridge, and the final three ascend from the east, and explore some of the eastern ridge. None will disappoint, and between them, they allow the exploration of the full length of this beautiful upland basin, and some of the bounding crêtes.